The Thermo Revco Lab Refrigerator REL2304 is built to keep temperature sensitive consumables and media safely stored within your lab. This 4°C Lab Refrigerator is constructed out of high-quality materials need to withstand the everyday ruggedness of today’s laboratory with a heavy duty, hermetically compressor and high impact powder coating inside and out. The 23 Cu ft, upright lab refrigerator comes with built-in microprocessor controls allowing user to toggle between temperature set points shown on a bright LCD screen. From this icon-based control panel users can set their parameters, set and silence alarms, monitor back up battery life and view visual alerts such as door ajar. Users of this Revco Refrigerator can key lock their settings to prevent accidental tampering. Inside the lab refrigerator is adjustable powder coated shelving with plenty of storage space, bright lighting for visibility and a thermometer monitoring system mimicking sample conditions. This lab fridge has excellent uniformity thanks to the high-density insulation that helps minimize the effect of ambient temperature fluctuations and the positive forced air flow to circulate throughout the cabinet. 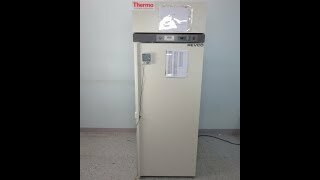 The Thermo Revco Lab Refrigerator has a temperature range of between 1-10°C and maintains at 4°C without issue. The solid door of this laboratory refrigerator has a full-length handle and will hold open at 90° to help with inventory loading, and will self-close with a gentle push. 29 x 24 x 58"
34" x 28" x 79"
This Thermo Revco REL2304A21 refrigerator is in great working order and and reached 4°C without issue. All of our lab equipment comes backed with our standard warranty. Should you have any questions about this or any of our other lab refrigerators, please don't hesitate to contact us.